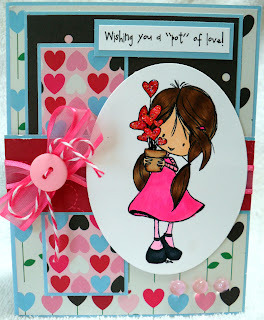 Welcome to Day Two of the Sweet Cards and Decadent Desserts Blog Hop! Each blogger participating in this hop is featuring a Valentine's Day card for someone special in their life, whether it be a husband, boyfriend, child, friend, teacher, parent, etc ... Each participant is also posting a recipe for a decadent dessert that you might want to make for someone sweet in your life! This is a two-day blog hop with some participants posting projects on both days. So, please be sure to check out yesterday's projects if you missed them! For today's project, I used a cute digi named Wryn from Tiddlyinks. I just love the flowerpot with the hearts growing from it. I think this digi is great in that it can be used for other occasions, not just Valentine's Day. I really enjoyed coloring her hair with my Copics. I did mess up with her dress, though. *sad face* I wasn't paying attention and inadvertently used my darkest shade of pink to color her dress. I was supposed to use it for shading. I think I could have attempted to fix it a little with the colorless blender (I THINK! ), but I decided to leave it alone. Lesson learned: Never assume you grabbed the right Copic pen. Double check before you start coloring! 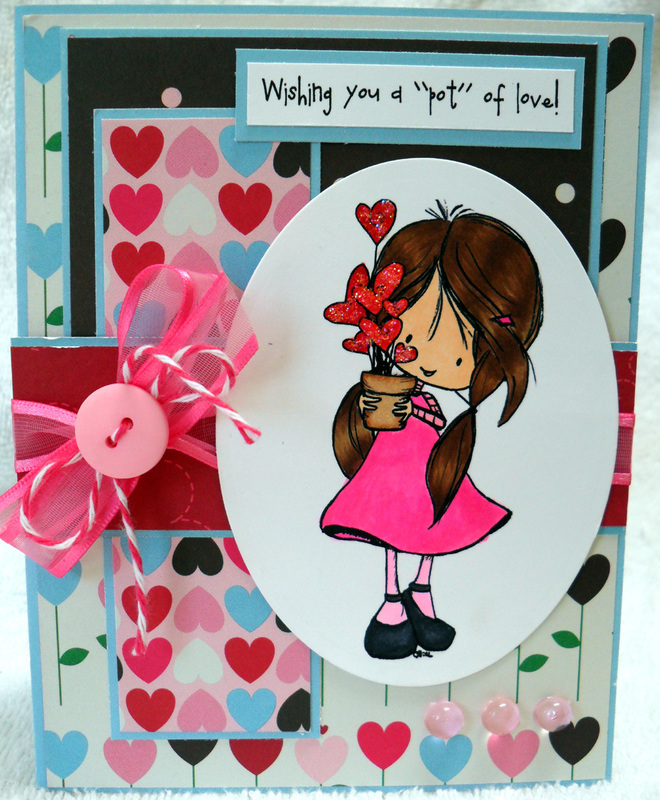 Other info: sentiment is from Tiddlyinks and sketch is from iheart2stamp.com. On to the recipe I'd like to share with you today. I'm sorry that picture isn't better. I took it with my iPhone which, unfortunately, does not have a flash. Oreo Truffles are very easy to make. They are very rich, and eating just two or three would be enough to satisfy most people! Combine the softened cream cheese with the crushed Oreo cookies. Shape into truffle-sized balls and placed on waxed paper on cookie sheet. Freeze for approximately 30 mins. Melt your chocolate or almond bark. Place a truffle on a fork and dip into the melted chocolate. Tap gently on side of bowl to allow excess chocolate to run off. Place truffle back on waxed sheet. Sprinkle topping if you have any. Repeat with the rest of the truffles. Place in refrigerator. 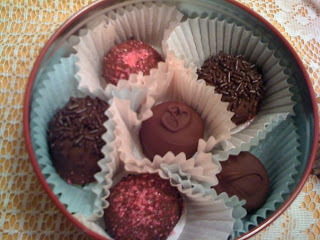 These truffles are so easy to make but sure do impress ! Thank you for stopping by my blog today. If you try my recipe, I'd love to hear how it turned out! Please hop on over to Anita's blog next to see what she has to share with you! Oops I'm not to keen on truffles too :(....but they sure looks yummy for that sweet tooth! Your card is so sweet! The little girl is so adorable and I love the pretty papers you used. Beautiful card. I love the digi you used. Your Oreo Truffles looks really good. I hope to try them. Your card is adorable. I love it. Oreo Truffles are the best. Thanks so much for sharing. Hey D Girl! Christy has the cutest images, huh? You did a great job on your card! And those truffles look deadly ... have a great week lady! wow. these look fabulous. I am a new follower and definately going to be back to steal some recipes.